The Province has a great number of attractions, from the wildlife reserve of Ujung Kulon on the southwestern tip of Java and the isolated communities of the mysterious Baduy to the unspoiled beaches. The villages are busy and attractive and the pace of life gets slower as we move towards the National Park in the southwest. 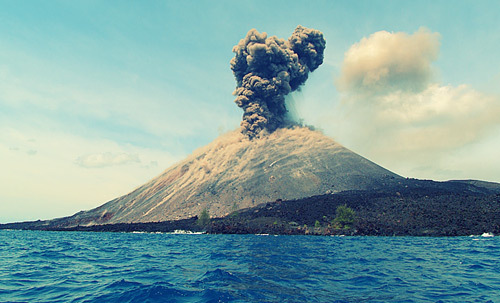 From any point along the western coast we can see the "son of Krakatau" volcano, which rises impressively from the sea. Banten offers many different recreational experiences. The trip to Anyer area from Jakarta is now quick and easy because of the toll road, which connects Merak port with Jakarta. As we move further south along the west Java coast the lifestyle becomes more relaxed and after Labuan we move into more rural areas where the road conditions worsen and the lifstyle is relaxed. Here access to the forest areas begins and we can move back in time and enjoy the peace of nature. There is a bus each day from Labuan to Taman Jaya, which is on the edge of Ujung Kulon national park. There are simple cabins can be hired and a ranger can then take us on a walk into the park. It takes about six hours to reach a camping site. Banten region is surrounded by Java Sea in the North. Sunda Straits in the West, and facing the India Ocean in the South. These make Banten as a region with very great of sea product resources. Total population in 2001 was 8,258,055 persons, consists of 4,231,079 men (51.24%) and 4,026,976 (48.76%). The densely populated regency is in Tangerang with its total population 2,873,256 persons. The highest density Region is Tangerang City 7,362.26 persons/Km2 in 1990 until 2001 period. Population growth from increased at 2.99%/year. Total workforce or aged 15 years above in 2001 was 3,330,224 or 52.57%. The coastal city of Banten, 75 kilometers west of Jakarta on the northern coast of Java, was one of the Asia's largest cosmopolitan trading harbors in the 16th and 17th century. Ships visited its port from Malacca, China, Vietnam, India, Arab, Portugal and Netherlands. At its peek, it was almost as important as Amsterdam. Nowadays Banten is only a small fishing village. There are still old buildings left which are worth a visit for someone who is interested in the history of Indonesia before and during the colonial times.